Containers like Docker have erupted in popularity, so much so that system deployment has been revolutionized. SPM now includes Docker monitoring support. Containers and Docker are all the rage these days. In fact, containers — with Docker as the leading container implementation — have changed how we deploy systems, especially those comprised of micro-services. Despite all the buzz, however, Docker and other containers are still relatively new and not yet mainstream. That being said, even early Docker adopters need a good monitoring tool, so last month we added Docker monitoring to SPM. We built it on top of spm-agent – the extensible framework for Node.js-based agents and ended up with spm-agent-docker. Monitoring of Docker environments is challenging. Why? Because each container typically runs a single process, has its own environment, utilizes virtual networks, or has various methods of managing storage. Traditional monitoring solutions take metrics from each server and application they run. These servers and the applications running on them are typically very static, with very long uptimes. Docker deployments are different: a set of containers may run many applications, all sharing the resources of a single host. It’s not uncommon for Docker servers to run thousands of short-term containers (e.g., for batch jobs) while a set of permanent services runs in parallel. Traditional monitoring tools not used to such dynamic environments are not suited for such deployments. SPM, on the other hand, was built with this in mind. Moreover, container resource sharing calls for stricter enforcement of resource usage limits, an additional issue you must watch carefully. To make appropriate adjustments for resource quotas you need good visibility into any limits containers have reached or errors they have caused. We recommend using alerts according to defined limits; this way you can adjust limits or resource usage even before errors start happening. How do we get a detailed metrics of each container? Docker provides a remote interface for container stats (by default exposed via UNIX domain socket). The SPM agent for Docker uses this interface to collect Docker metrics. 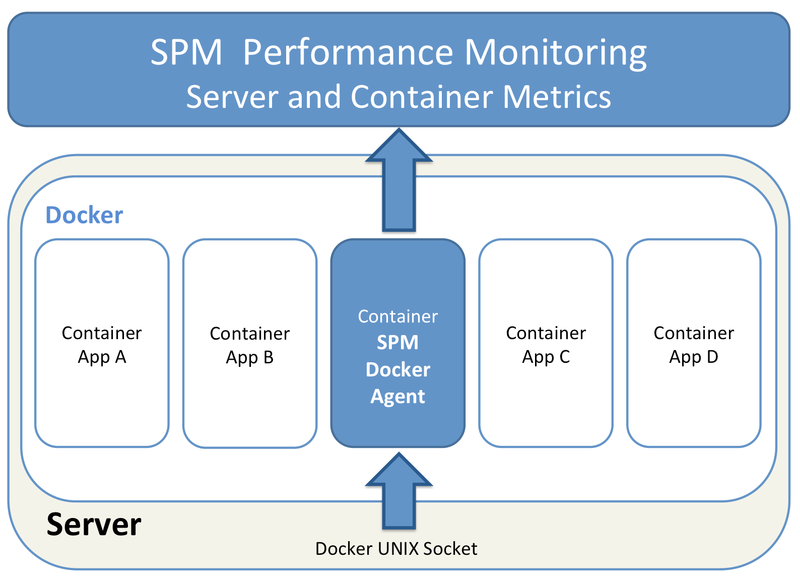 SPM uses approach 3), aka the “Docker Way”. Thus, SPM for Docker is provided as a Docker Image. This makes the installation easy, requires no installation of dependencies on the host machine compared to approach 1), and it requires no configuration of a server list to support multiple Docker servers. You’ll see your Docker metrics in SPM after about a minute. 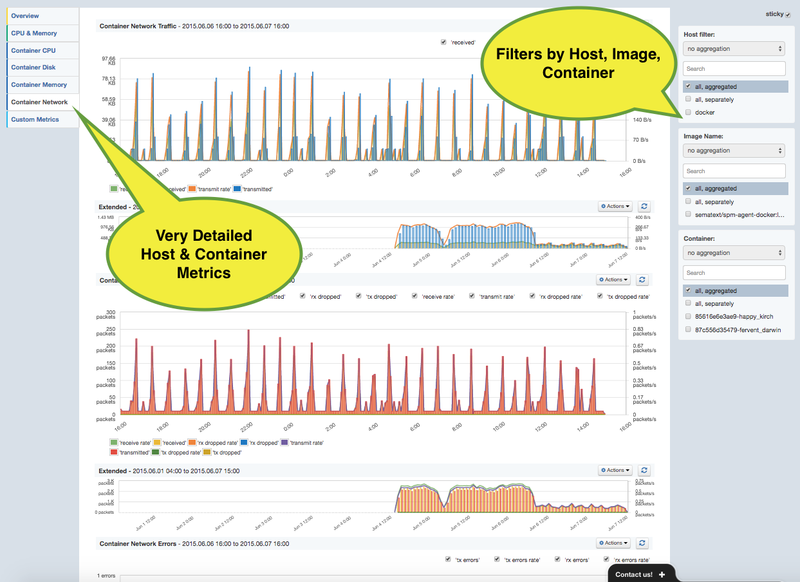 Did you enjoy this little excursion on Docker monitoring? Then it’s time to practice it! We appreciate feedback of early adopters, so please feel free to drop us a line, DM us on Twitter @sematext or chat with us using the web chat in SPM or on our homepage — we are here to get your monitoring up and running. If you are a startup, get in touch – we offer discounts for startups!